The NFL anthem-protest controversy heated up again on Sunday, but this time President Trump wasn’t directly involved. 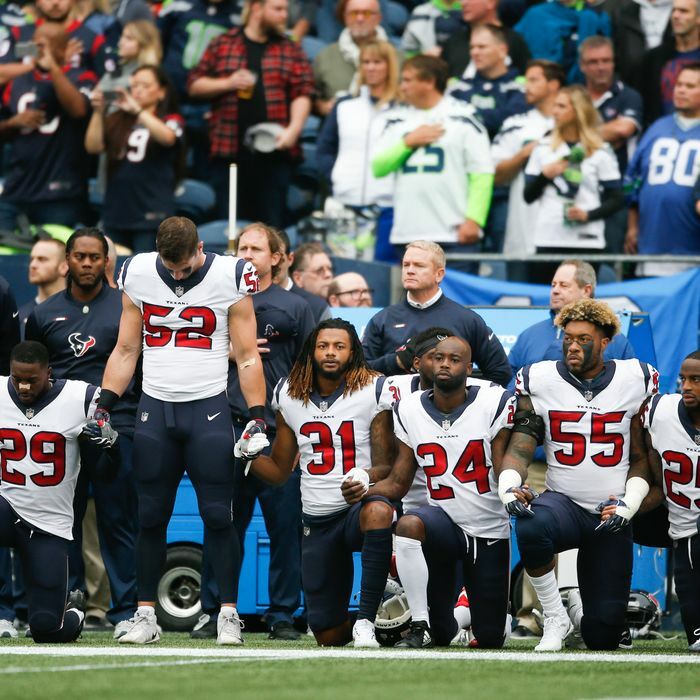 On Friday ESPN The Magazine reported that during a discussion of the ongoing anthem protests at a recent owners meeting, McNair commented, “We can’t have the inmates running the prison.” The piece said several people in the room were “stunned” by the remark, and Troy Vincent — a former player who is now the NFL’s executive vice-president of football operations — told the owners that he was offended. Players said they were discussing how to respond as a team, and there were reports that they would remove the Texans logo from their helmets. CBS did not air the anthem, but photos and videos showed more than 40 players kneeling. On the other side of the field, several members of the Seattle Seahawks sat on the bench during the anthem, as they’ve been doing all season to protest racial injustice.